It's looking more and more likely that we're going to have another El Niño year starting this summer — one that could possibly rival 1997's infamously bad event. But just what does that mean? As this map demonstrates, it can mean very different things around the globe. The map is the work of NOAA and is by no means a prediction or promise of how this year's El Niño might fall, or even if there will be one at all. 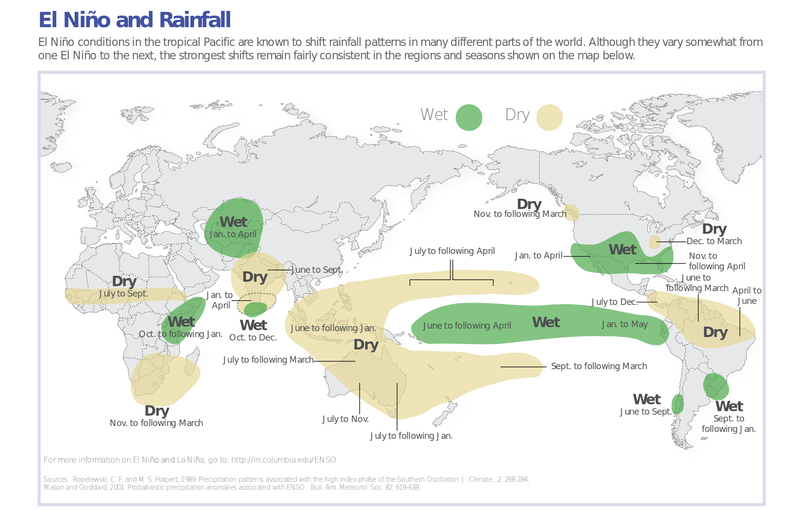 What it does do, however, is give an overview of how researchers have observed El Niño altering precipitation patterns around the world since 1950. As you can see, some areas are likely to be prone to the heavy rains, storms, and flooding that we often associate with El Niño. But other areas could experience unusual dryness, perhaps even drought.